If you want a wowzer dessert for the holidays, you've found one here. It's homemade! It's super chocolately! It's easy! AND you can make it a few days ahead of time. 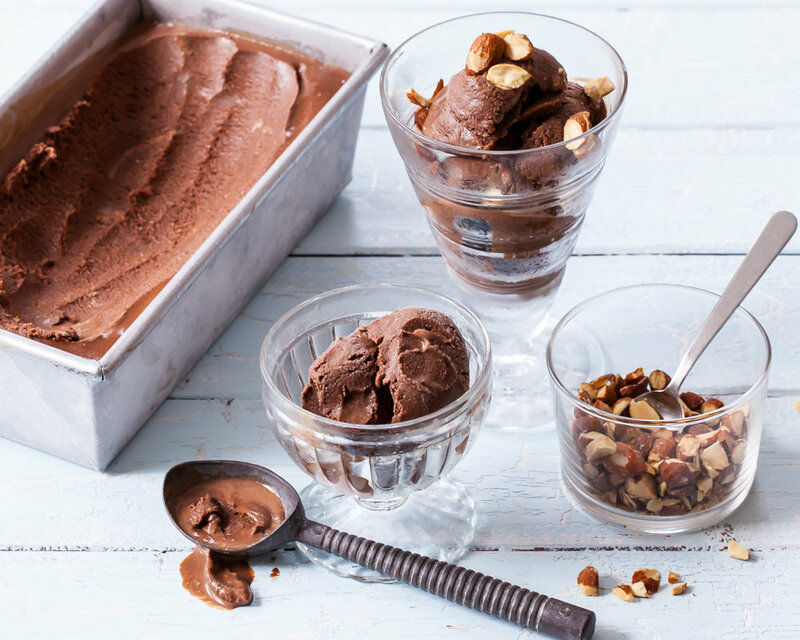 This dark chocolate gelato has the characteristic, no-holds-barred chocolate intensity of gelato. Milk, not cream, is the differentiating factor between ice cream and its Italian cousin. Because there is less butterfat to coat the tongue, the flavor pops. Another ingredient, corn syrup, behaves like invert sugar and helps reduce the chance of crystallization when freezing. A gelato or ice cream machine churns the mixture slowly and cuts the amount of air to keep the mixture dense and creamy, so it is less fluffy than ice cream. It also melts a lot faster than ice cream. But enough science. The best part of this gelato is that you can make it without a machine. Make the mix, which does not contain eggs, freeze until firm (overnight is best), and then cut the frozen slab into pieces. Whirl the frozen slices in a food processor. Pack the creamy mixture into a container and let it firm in the freezer for a few hours. Ecco la! You now have a frozen dessert to wow the senses. 1. In a small bowl, whisk 1/4 cup of the milk and the cornstarch together until smooth. 2. In a large (6-quart) saucepan, whisk the cocoa powder and sugar together until blended. Gradually whisk in 1/2 cup of the milk until smooth. Set the saucepan over medium heat and stir in the remaining milk, corn syrup, salt, and cornstarch slurry. 3. Stirring constantly with a heatproof spatula, bring to a rolling boil. Boil for 45 seconds to cook the cornstarch, adjusting the heat as necessary to prevent the mixture from boiling over. Remove the pan from the heat and add the chocolate, stirring until completely smooth. Stir in the vanilla. Cool to warm room temperature. 4. Line a 9-inch square pan (preferably metal) with plastic wrap. Pour the gelato mixture into the pan and freeze 6 hours or overnight, until firm. 6. One-third at a time, process the frozen chunks in a food processor until the gelato looks creamy and no frozen chunks remain. Pack into a container, and continue until all the gelato is used. Press the top with a piece of parchment paper, and cover. Freeze for several hours, or until ready to serve. When ready to serve, remove from the freezer. If the gelato has frozen until hard, let it soften for a few minutes before scooping. Sprinkle with chopped almonds.